Sometimes a guitar comes along that makes everyone sit up and pay attention – and in our chart of great guitars for beginners, Squier’s Vintage Modified ‘51 is one of these instruments. It promises super vintage style, modern playability and incredible versatility at a head-scratchingly low price. So how does it deliver? 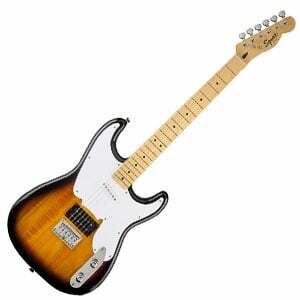 This brand new model from Squier is an interesting guitar that’s heavily influenced in style by three Fender classics. Firstly, it features the well-contoured body of a Stratocaster, with its deep double-cutaway offering superb access to the highest frets. Then you have the familiar slim headstock of a Telecaster, along with the large body-engulfing pickguard of the P-Bass – aka the ‘51. So it’s already iconic in style and oozing vintage looks, while feeling comfortable and relaxed to play. The body is crafted from basswood and features a traditional two-tone Sunburst finish, although can also be found in the equally delicious Candy Apple Red or Vintage Blonde. Finally, the bolt-on satin-finished C-shaped maple neck has a matching maple fretboard, with 21 medium-jumbo frets. For such an affordable guitar, this is so playable – fast and smooth, with easy string bending. The Vintage Modified ‘51 excels in both body design and – as you’ll soon read – its electronics, but there’s nothing to really get excited over when it comes to hardware. You will find a six-saddle hardtail bridge, meaning there’s no whammy bar, but this ensures the guitar is more stable in its tuning – which is arguably more important for beginners than vibrato capabilities – as well as having increased sustain. This tuning stability is also improved by the standard die-cast tuners that sit on the Tele headstock. Nothing sensational, but they do what is asked of them. Two pickups can be found on this ‘51 – there’s a Squier-designed ‘hot’ open-coil humbucker at the bridge position, with a standard Strat single-coil pickup at the neck position. A versatile combination on its own, further enhanced by the controls. There’s a master volume ‘chrome dome’ control knob, which doubles-up as a very convenient push/pull coil-split to turn your humbucker into a single-coil at the bridge position. The second control knob is a three-way rotary pickup selector, so you can choose which pickups are in action with a quick turn. With such versatility in the electronics, there’s no end to the sounds this excellent ‘51 can produce, with warmth and twang aplenty. The neck single-coil is superb for vintage rhythm and lead playing, especially with a little crunch. The bridge humbucker is a little raw and noisy, but it gives a good output and, through a good amp or distortion pedal, is thick, meaty and aggressive enough for modern rock, punk and even metal. But experimentation with the pickup pairings and coil-split allow for too many tones to mention. The Vintage Modified ‘51 is the complete package – affordable, highly playable, good looking, very versatile – and would appeal to an experienced player as much as a complete beginner. Not many guitars can boast that. Truth be told, Squier could charge up to $400 for this and they’d probably get away with it. For under $200, it’s an absolute steal. For more info about the Squier Vintage Modified ’51, click here. For more beginners electric guitars you might like, click here.